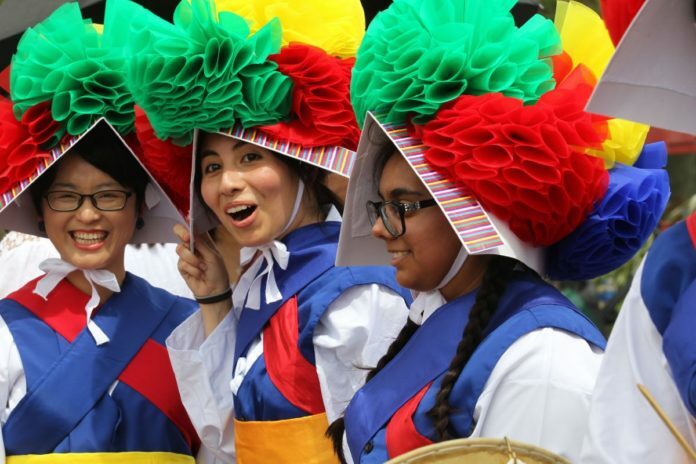 Mijin Oh Villarreal , Clarissa Fausto and Brenda Moreno get ready to perform with Korean Percussion instruments Samulnori during the Fiesta de Palmas at McAllen Convention Center on Saturday ,Sept. 22,2018, in McAllen. Fiesta De Palmas, formerly known as PalmFest, kicked off Saturday afternoon with familiar activities such as the Grito celebration, along with some new attractions. The annual event boasts a new moniker that was made to reflect the region’s ties with Mexico. Coorganized with the Consulate of Mexico in McAllen, the booths lined around the McAllen Convention Center fountain sold all the same Mexican foods and artisan goods that have been at PalmFest in years prior. Stephanie Ramirez, marketing and special events supervisor with the City of McAllen, said the rebranding gives the event an opportunity to branch out, while still maintaining traditions. Different sections of the convention center were labelled as different parts of the world. Right beside K-pop fan booth, Juan Li, with the University of Texas Rio Grande Valley, was writing out attendees’ names in Chinese calligraphy. Li said calligraphy is a dying art form that not all Chinese people know how to do nowadays. Showing up at events like Fiesta De Palmas is one way Li tries to keep the skill alive. Rujman Khan, a biology student at UTRGV and president of the Muslim Student Association, also sees the value in using language as a way to share cultures. Similar to Li, Khan was writing participants’ names in Arabic. Woven in between booths like Khan’s and Li’s were giant decorated guitar sculptures and booths selling PalmFest staples, such as tacos, aguas frescas and more. Fiesta De Palmas continues on into Sunday with a performance by Ramon Ayala.